Title: Antonio Rosetti: Requiem Fur Mozart Artist: Antonio Rosetti Genre: Classical|Sacred Choral/Vocal Format: SACD No. 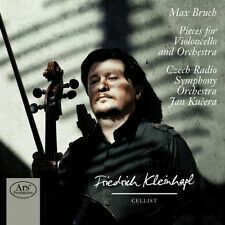 of Discs: 1 disc(s) Studio / Label: ARS Produktion UK Release Date: 23 Jun 2011. Title: Vestard Shimkus: Interview With Beethoven. Genre: Classical. Condition: New. Further Details. Format: CD. Release Date: 2011-09-23. Title: Trio Panta Rhei: Piano Trios. Condition: New. Catalogue Number: ARS38097. Sub Genre: Chamber. Genre: Classical. Release Date: 2011-09-23. Title: Signum Saxophon Quartett: Ravel/Grieg/Schostakowitsch/. Condition: New. Missing Information?. 1-1 Holberg Suite, Op. 40 1-2 Tango Virtuoso 1-3 Le Tombeau De Couperin 1-4 Six Romanian Folk Dances 1-5 Elegy 1-6 Polka 1-7 Pequeña Czarda. Artist: Storioni Trio. Title: Piano Trios 2. Format: SACD. Title: Nino Rota: Cello Concertos and Il Gattopardo. Condition: New. Allegro Sostenuto 1-10 Polka 1-11 Quadriglia. Allegro 1-12 Galop. Allegro Molto 1-13 Valzer Del Commiato. Sub Genre: Orchestral. Genre: Classical. Artist: Friedrich Kleinhapl. Format: SACD. Title: Pieces Cello Orchestra. Romance, for Viola & Orchestra in F Major, Op. 85. Kol Nidrei, for Cello & Orchestra, Op. 47. Ave Maria, for Cello & Orchestra, Op. 61. Artist: Trio Panta Rhei. Title: Piano Trios. Format: SACD. Allegro Molto. Allegro Giocoso. Blues for Schubert. Title: Die Jahreszeiten. Format: SACD. Artist: Bruno Weil. Title: Vestard Shimkus: Interview With Beethoven. Genre: Classical. Missing Information?. Condition: New. Format: CD. Title: Johann Sebastian Bach: Violinkonzerte. Genre: Classical. Sub Genre: Concerto. Missing Information?. Condition: New. Further Details. Format: CD. Title: Signum Saxophon Quartett: Ravel/Grieg/Schostakowitsch/. Missing Information?. Condition: New. SKU: 4260052380949. Sub Genre: Chamber. Genre: Classical. Title: Nino Rota: Cello Concertos and Il Gattopardo. Condition: New. Missing Information?. SKU: 4260052381052. Sub Genre: Orchestral. Genre: Classical. Sub Genre: Chamber. Title: Rare Chamber Music. Genre: Classical. Release Date: 2011-08-01. Missing Information?. Condition: New. Format: CD. Title: Anton Reicha: Chamber Music for Bassoon and Strings. Sub Genre: Chamber. Genre: Classical. Release Date: 2011-05-20. Missing Information?. Condition: New. Title: Trio Panta Rhei: Piano Trios. Missing Information?. Condition: New. SKU: 4260052380970. Sub Genre: Chamber. Genre: Classical.